The goal of the journal is to eliminate the gap, which occurs between the rapidly emerging new scientific knowledge and their introduction in the industry, which requires much more time. 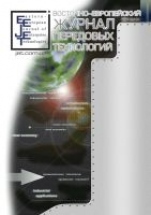 Industrial enterprises are active subscribers to the "Eastern-European Journal of Enterprise Technologies", and production engineers check the practical value of those scientific and technological ideas, which are recommended for implementation by scientists-authors of the ''Eastern-European Journal of Enterprise Technologies". The objective of the journal in achieving the goal is forming a "scientific component" of modern technologies transfer from science to industry. Therefore, in the papers, published in the journal, the emphasis is placed on both scientific novelty, and practical value.